With great sadness, the Board of Directors of Dharma Civilization Foundation, announce that our Founding President, Dr. Shiva Bajpai, passed away on Saturday January 13th 2017. When Professor Bajpai retired from active teaching, he found himself engulfed in a new struggle that came to be called the “California Text-Book controversy”, which centered on the teaching of the history of India and Hinduism in California K-12 schools. From 2005 to 2009, he worked with the staff of Hinduism Today to create the book “The History of Hindu India” intended for middle school as a corrective to the erroneous material common in the officially prescribed textbooks. The book has also been turned into a well-received five-part documentary series available on You Tube. His encounter with the existing entrenched challenges in the narratives about Hinduism in the academy, further led him to the founding of Dharma Civilization Foundation. Serving as its first President and a trustee, Professor Bajpai helped guide and shape its mission, which was to “facilitate and promote” the understanding of India’s Civilization, Religion and Culture through education, by establishment of centers, endowed chairs at undergraduate and graduate colleges and universities, new courses, scholarship, and journals. In this capacity, Professor Bajpai guided Dharma Civilization Foundation in creating the Center for Dharma Studies at the Graduate Theological Union, Berkeley, California, in a very short period of time. DCF is now involved in several initiatives both in California and around the world at all levels of higher education. 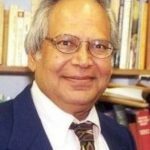 We celebrate the life of Professor Shiva Bajpai, and will deeply miss him, even as we rededicate ourselves to the vision and mission of Dharma Civilization Foundation, that he helped create and nurture.